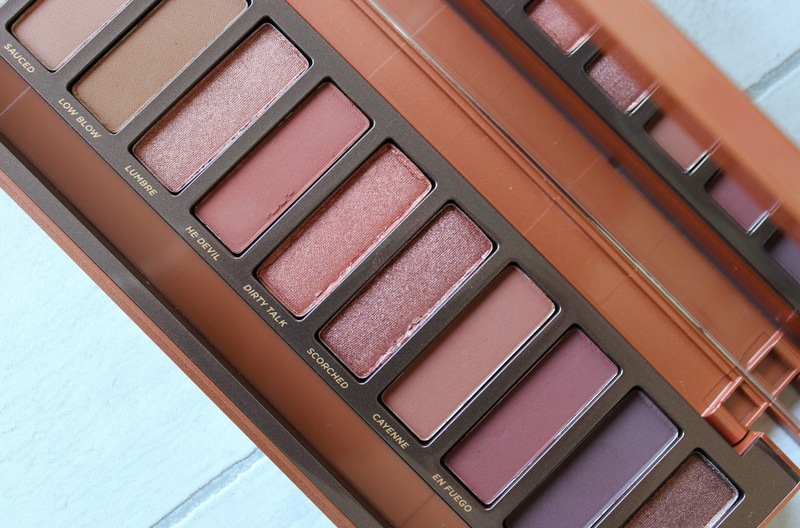 From the moment I saw the press release for the new Urban Decay Naked Heat Eyeshadow Palette, it was love. 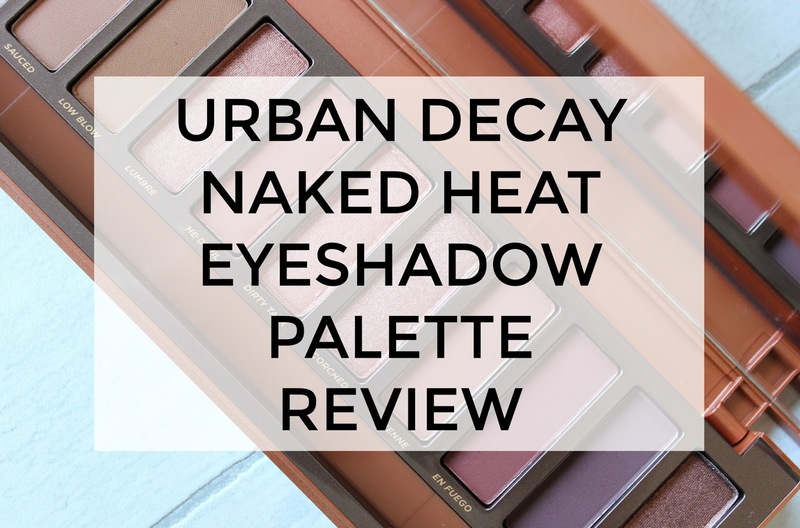 The Naked range is one of my favourite eyeshadow ranges and I am the biggest fan of Urban Decay and their formulas, particularly for their eyeshadows, so I knew it would be a winning palette for me, but what had me excited the most was the shade selection. OK, first, let’s talk packaging. Each new Naked palette has gone one step further in creating a bold visual effect. 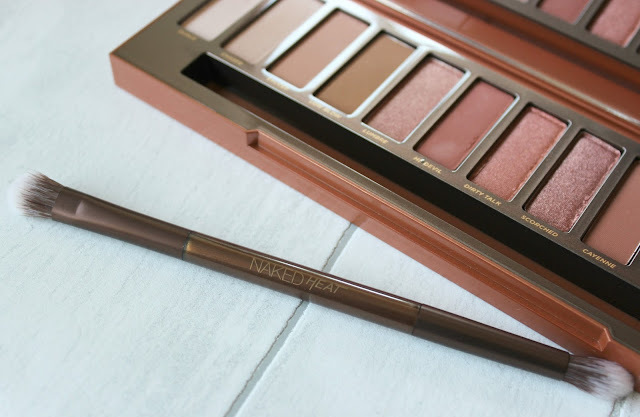 The Naked and Naked 2 palettes were fairly similar in design, with the Naked 3, Naked Smoky and Naked Ultimate palettes being quite striking in contrast - the Naked Basics palette range has always had a very lovely simple take on packaging. 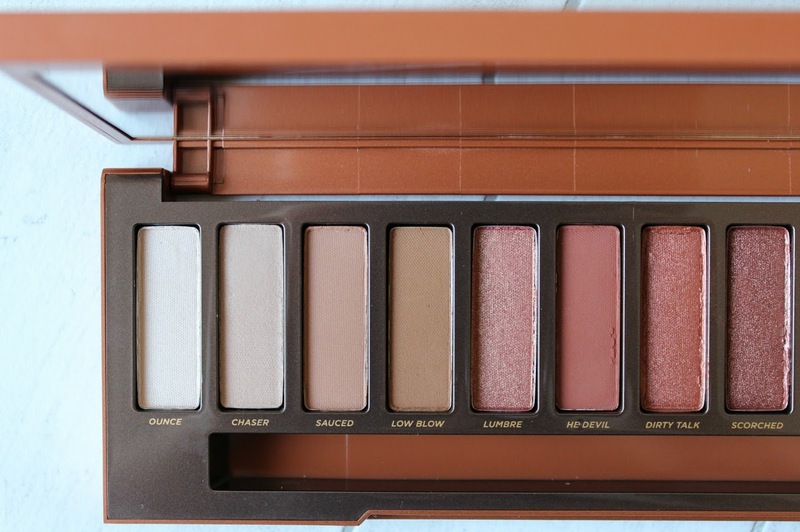 The design of Naked Heat palette is by far my favourite appearances wise, it’s just absolutely stunning to look at. 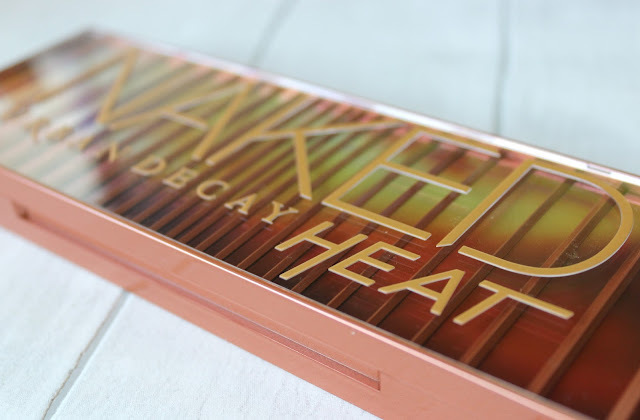 Like all Naked palettes, it comes with a compact mirror inside as well as a dual-ended Urban Decay Eyeshadow Brush, with the Naked Heat featuring 12 1.3g shadows. As you’d imagine with the Heat theme for this palette, the shadows featured have a red/bronze/coppery theme. Although I do think the shades are pretty wearable for all complexions, paler beauties may find the shade selection looks redder than anything else, which, depending on confidence levels with bold makeup, could be harder to utilise. For me, with a naturally olive Mediterranean complexion, I find every single shade works really well with my skin tone. 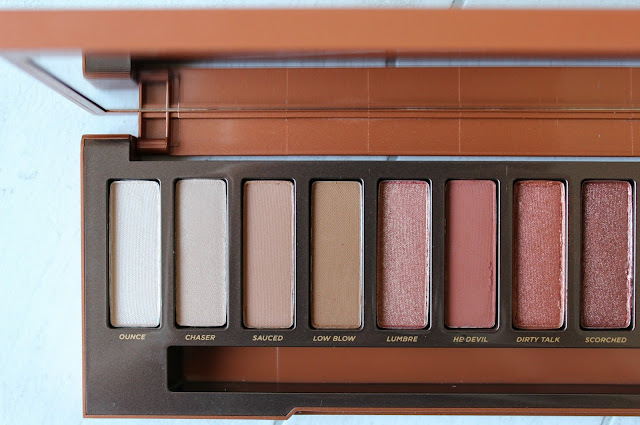 It’s a palette I personally feel would work best for those with warm undertones. 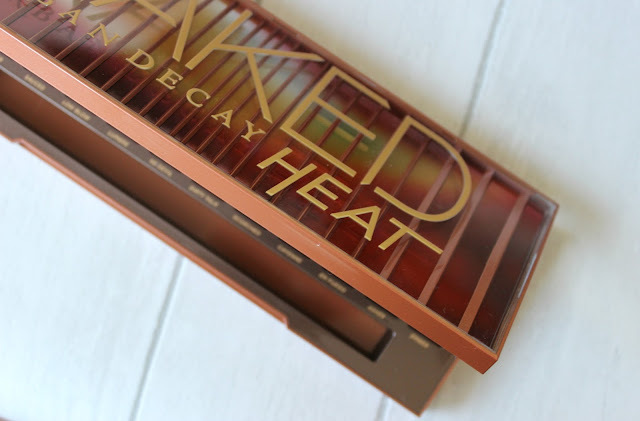 The 12 shades featured in the Naked Heat palette are all completely new shades to the Urban Decay range, so no repeat shades as can often occur in eyeshadow palettes. Each shade features the Urban Decay Pigment Infusion System, a blend of ingredients which provides each shade with their velvety soft texture and pigment-rich colour payoff. The shades include a variety of finishes including matte, micro-shimmer, metallic, pearl shift and shimmer. All of the shades featured in the Naked Heat palette have warm undertones. For me, there are a few stand-out shades in the palette, such as Lumbre, Dirty Talk, Scorched and Ember, but overall, I like every single shadow included. It just screams autumn, don’t you think? I have a feeling it’ll be my go-to, if not the only palette I reach for, during the cooler autumn months. I find the formula to be typical to the quality I’ve come to expect from Urban Decay; velvety soft, full of intense pigment and really easy to blend. I’ve seen a few reviews mention that some of the shimmer or micro-glitter shades are harder to work with, but I think it’s the tools and techniques you use; I personally haven’t had any issues with applying and blending these shadows. Do I think it’s a must have palette? Yes - but not for everyone. I think you need a bit of confidence for such a bold warm toned palette and some of the more striking red shades may not work with all complexions. Personally, I adore this palette and for me, it’s one of the best shade-wise; I’m confident with the shade range, tone and finishes. Is it worth the hype? Yes, yes, yes! 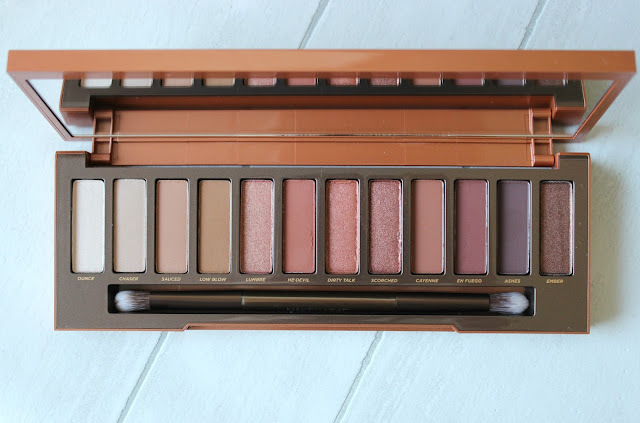 Urban Decay always delivers with their Naked releases and this is no exception. Are Urban Decay Naked palettes really worth the hype? I really want this palette. I know its supposed to be a summery one but I think I'd wear this much more during autumn! 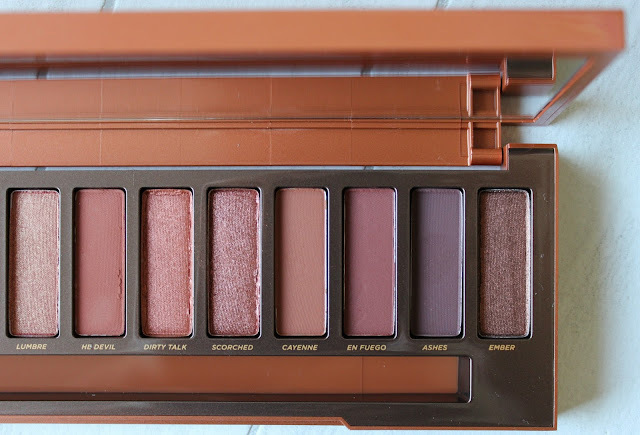 I really want to get my hands on this palette, I think the warm tones would be perfect for me! I love this palette! I've been eyeing it up for far too long! I'm pale skinned,but bought this palette even though it's WAY outside my comfort zone . I've had so much fun playing with it. I've done looks just with this palette, as well as doing looks by teaming it with my KVD shade and light palette. I think it's more versatile than it might appear at first glance. On deeper complexions, the bolder colours and shimmers must look amazing.